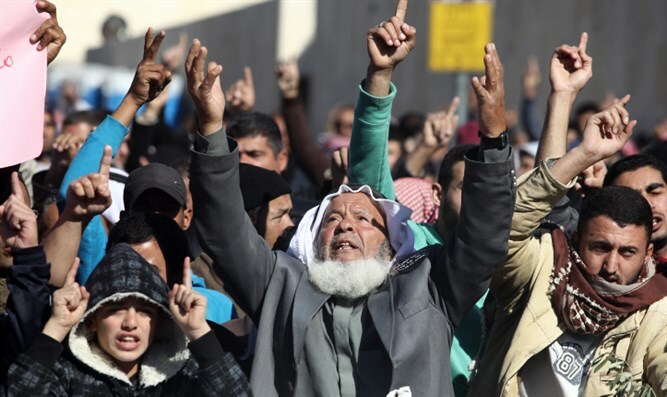 Arab protesters on Monday threw eggs at a US delegation in Judea and Samaria and held up signs with anti-American slogans in a bid to prevent them attending an event. Around 15 protesters confronted a vehicle from the US consulate in Jerusalem as it made its way into Beit Jala, near Bethlehem, and pelted it with eggs, an AFP photographer said. They also held up signs that read: "US government you are not welcome in Palestine". Another one read: "Hey Trump, Jerusalem is not the capital of Zion". The cars then left the area. In December, US President Donald Trump announced his decision to recognize Jerusalem as the capital of Israel, and last week the United States transferred its embassy from Tel Aviv to Jerusalem. His move has infuriated the Palestinian Authority, which seeks the eastern part of Jerusalem as the capital of their future state. The city is the capital of Israel. A US State Department official denounced the protest as "intimidation", saying the delegation from the US consulate was there to "promote education and cultural exchange with the Palestinian people." "Though no one was hurt, the objective was clearly intimidation. The United States absolutely opposes the use of violence and intimidation to express political views." The PA has frozen ties with the White House over its recognition of Jerusalem as Israel's capital.